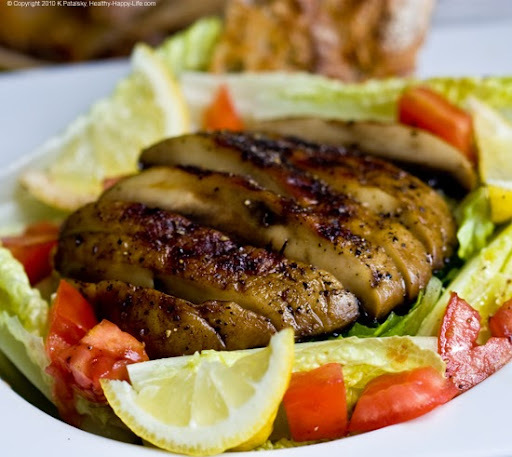 Grilled Portobello Mushroom Salad. 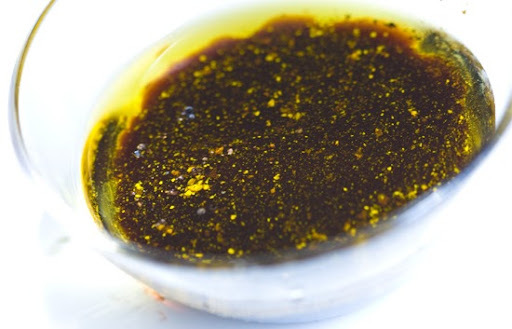 Lemon Dressing. Sweet/Savory Salad Flavors. 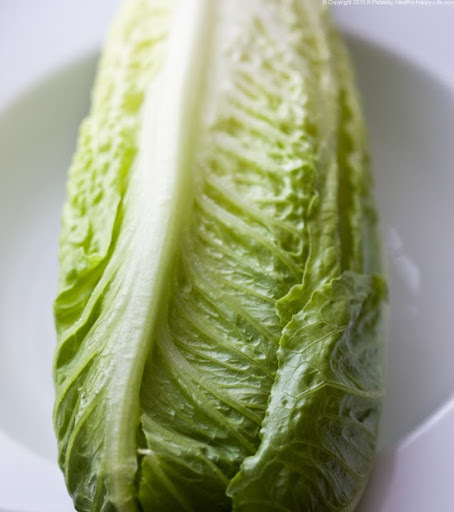 A crisp chopped romaine salad is lightly dressed in a spritz of lemon juice and EVOO - plenty of fresh black pepper. On top of that is the sliced balsamic-grilled portobello mushroom - more thick black pepper crusted on top. 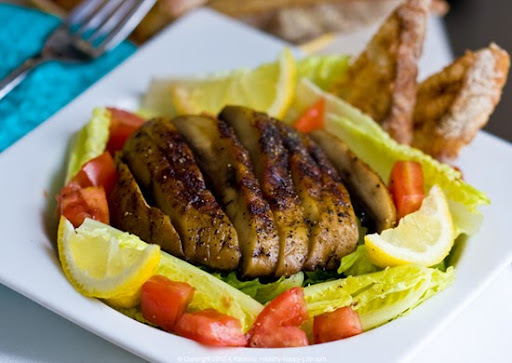 The salad is accented with lemon wedges, cubed tomatoes and grilled bread. I like to serve it with roasted garlic hummus. My bevie of choice: peach/mint iced tea. Cravable? Yes! Portobellos. 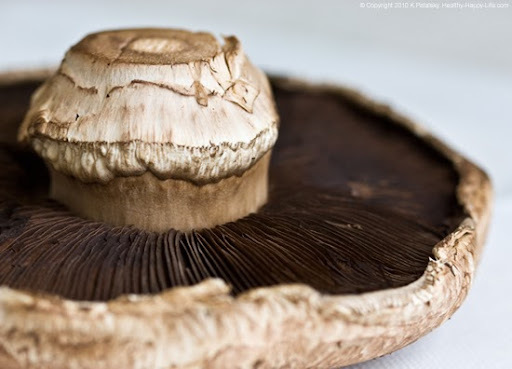 Classic or cliche, the portobello mushroom is a classic ingredient for a vegetarian or vegan dish. 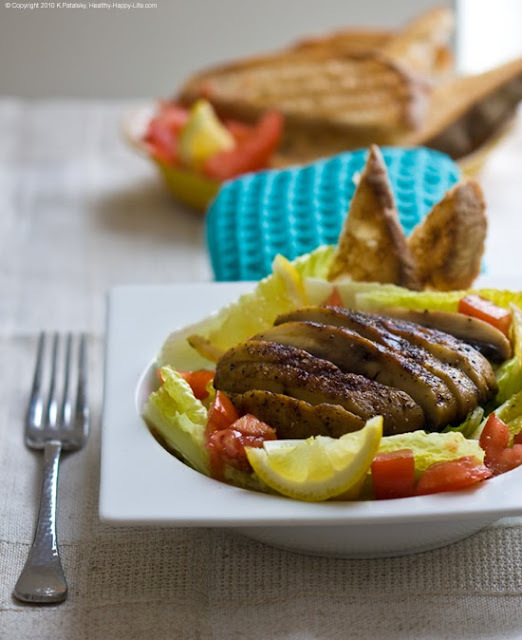 Long before veggie burgers glammed themselves up into using lentils, beans, rice, potatoes, veggies and more - the grilled portobello was the perfect meat-free substitute for your burger bun. 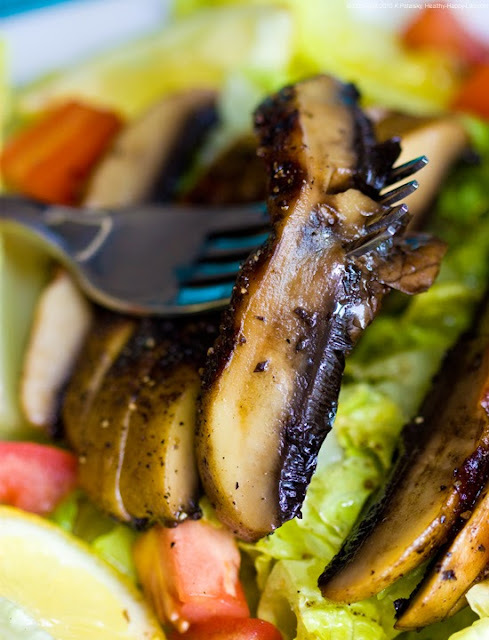 So this salad is a tribute to the timelessly delicious veg-friendly ingredient: portobello mushrooms. How to Grill? 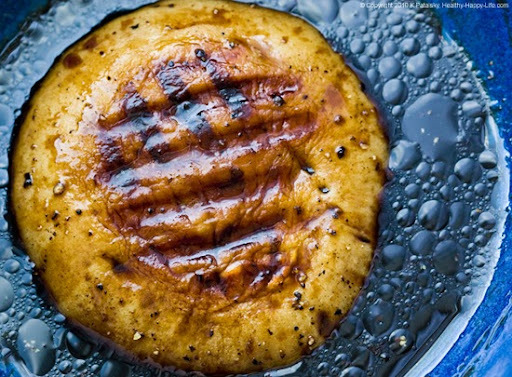 I grilled the mushroom on my panini press. I didn't even turn on my stove. Nice. 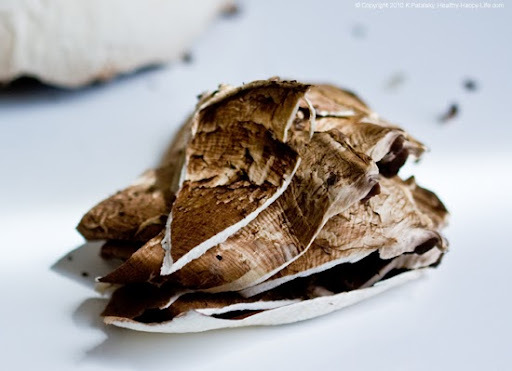 You can grill the mushroom on a panini press, stove top grill pan or even an outside BBQ grill. If you have to use a flat saute pan, that's fine too - but you will miss those lovely grill marks. To Peel or Not to Peel? Earlier today I asked my twitter buddies if they like to peel their shrooms. I struck a nerve because most everyone gasped in disbelief as if I had just ripped the muffin top off a muffin. 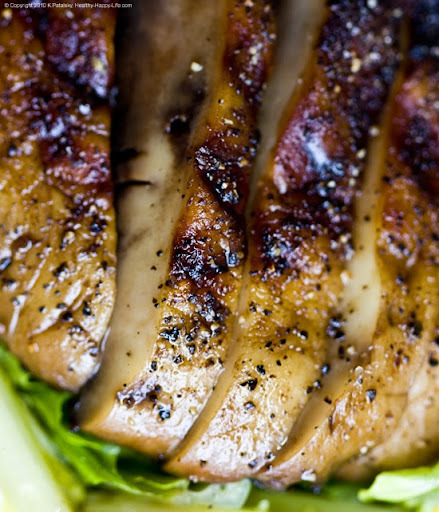 Well give my peeled mushroom method a try - I like it because the mushroom soaks up more flavorful marinade than if I had left the peel on. 1. 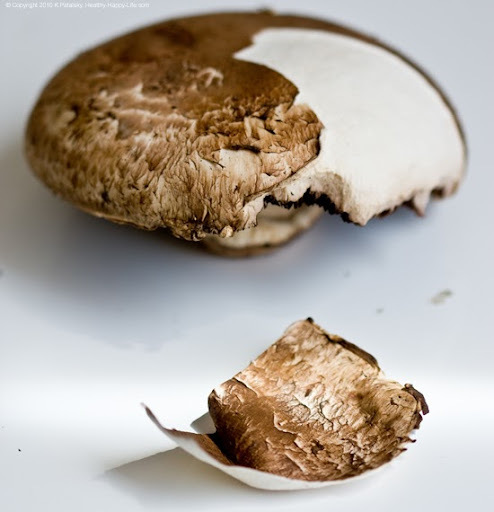 Grab your mushroom and peel it. 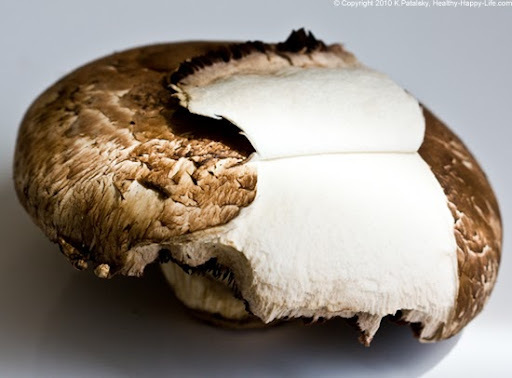 Slice off the thick stem so the shroom lays flat. 2. Whisk together your marinade ingredients in a shallow bowl. Add your mushroom to the marinade and allow to soak for a few minutes - on each side. 3. Turn on your grill or panini press. 4. 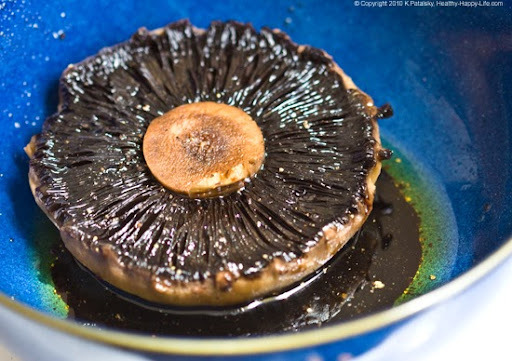 Place marinated mushroom on grill. Also place a few stacked slices of bread. 5. 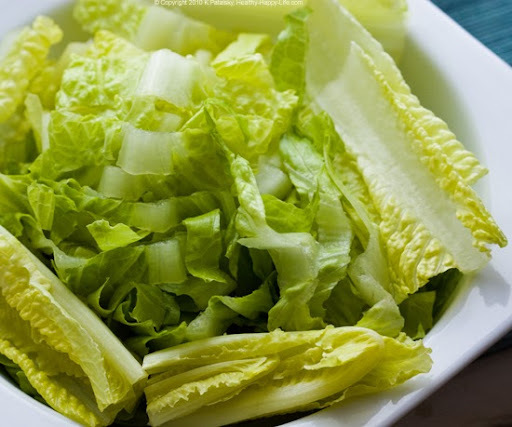 While the mushroom is cooking, slice your romaine lettuce and place in a shallow salad bowl - or plate. 6. Dress the salad in your super simple lemon dressing: squeeze a lemon over top, drizzle some EVOO and grind fresh black pepper over top. Capers dotted on the greens would be a nice touch as well. 7. 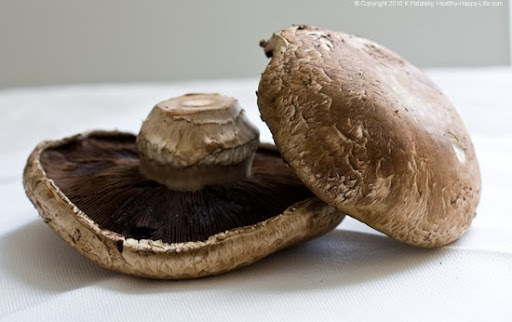 Your mushroom should be done after about 5 minutes. Grab it and dunk it back in the leftover marinade for a quick cool-off soak. Then place on cutting board to slice into thin strips. Add a pinch of coarse sea salt if you'd like. 8. 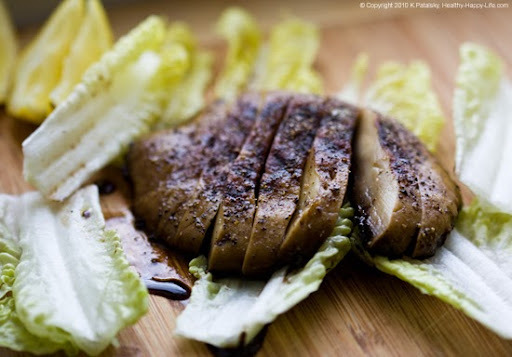 Lay sliced mushroom over top your romaine salad. Add more fresh black pepper over the top of the mushroom. 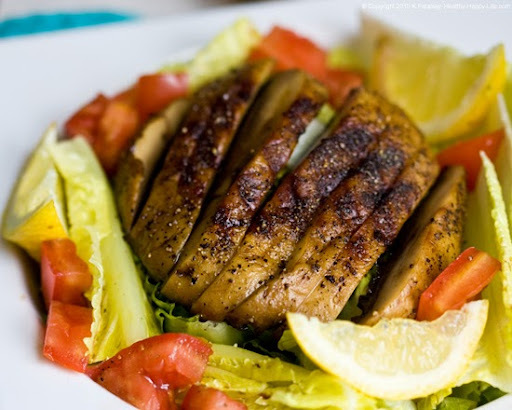 Slice your tomato, soak the cubes in the leftover balsamic marinade and add to salad. 9. 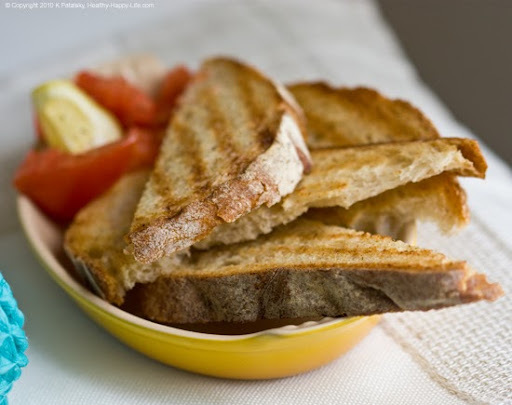 Grab your grilled bread slices and cut into triangles. Plate salad with a few triangles of bread and an optional side of roasted garlic hummus.